If you've ever wondered how Italians can make a simple grilled lamb chop recipe taste so fantastic then wonder no more because the secret is here. Today's marinated grilled lamb chops come fresh with the influences of Abruzzo (a region of Italy on the Eastern Adriatic side about halfway down) where I lived and worked for three or four months. For that reason I go to my butcher for lamb. Much of what arrives in our supermarkets in the UK is frozen from New Zealand so it's not fresh and it has traveled a serious amount of food miles. There's nothing wrong with New Zealand lamb, I just want to buy the lamb that skips about in the field opposite my house. 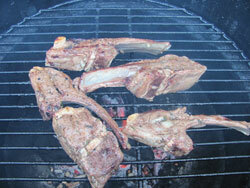 Off my soap box, here's the grilled lamb chop recipe. The marinade needs a couple of hours but no more, use this link to learn more about the science behind barbecue marinades and why 2 hours is long enough. After that, the ingredients take minutes put together and the grilling doesn't take much longer either, all you need to do is throw it all together. There's enough marinade here to do about eight chops. 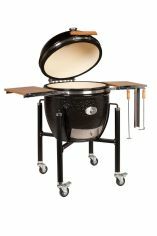 Note:- This barbecue, not fine dining. If I were looking to impress then I would chine the bones of the chops. This is effectively the process of removing the meat from the rib bone and just leaving the eye of the chop. It looks pretty, but it's a waste of good flavoured meat and fat (that will render onto the coals and create the smokey falvour that we are looking for). Once all the ingredients have been prepared, pour them into a resealable plastic bag and mix simply by squeezing the bag or seal the bag (extract most of the air) and give it a mulch. Now add the lamb chops to the bag, again, extract the air, seal it, give it a good shake and leave it to marinade for at least an hour but no more than two. Overhaul the bag every now and then to make sure that the marinade gets every opportunity to be in contact with the surface of the meat. 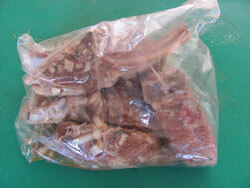 Assuming you started off with refrigerated chops you don't need to continue to refrigerate during the marinade time. When your grill is good and hot, cook the lamb chops for about 3 minutes on each side for medium rare (and step that up to 4 minutes if you want medium). When done, take the chops off the heat, transfer to a warm plate and let them rest for 5 minutes if you can resist them for that long. Here's the video of this marinated grilled lamb chop recipe with some very dodgy camera work from my daughter and even worse knife skills from me!